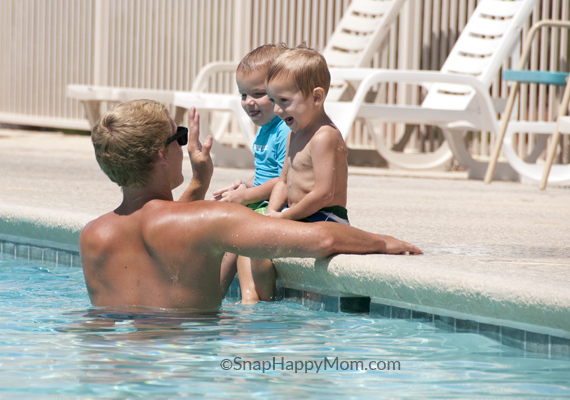 Swimming lessons are a big deal for kids – they are a rite of passage! But they can be tricky to photograph sometimes, because the pool itself can limit mobility, and it’s hard to tell what’s happening in the pool sometimes. 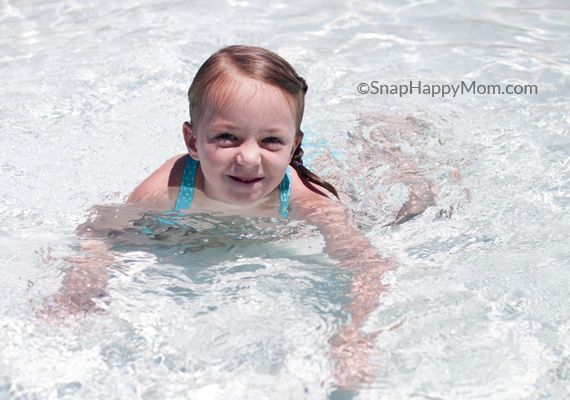 Here are a few tricks I’ve found to taking better photos during swim lessons. 1. Take pictures immediately before and after the action happens. 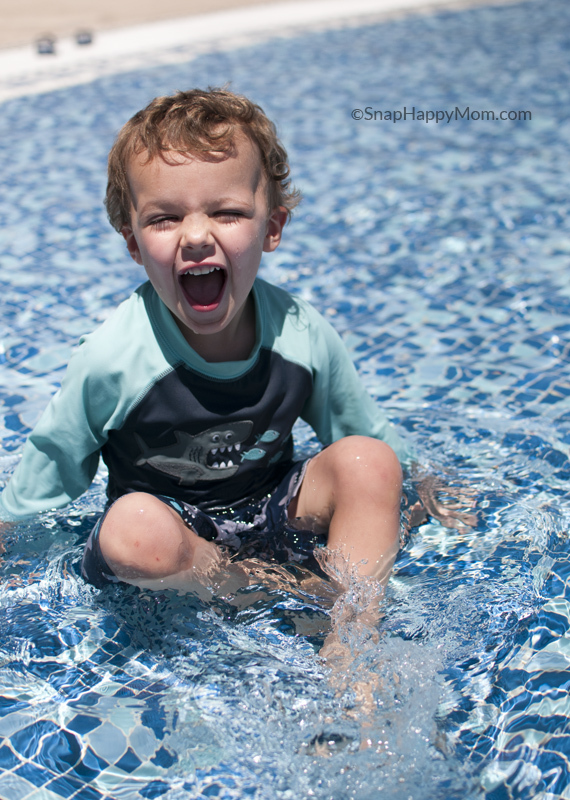 Here’s an example of my son going underwater for the first time. 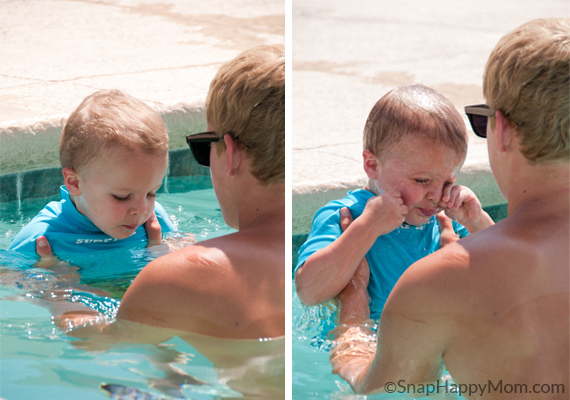 On the left he is ready to to blow bubbles, and on the right he has been dunked and is slightly flustered. Together, you get the story. You don’t always need both pictures to tell the story, as long as you capture some emotion. Look for anticipation and surprise! To get a photo like the one above, I set my shot up and then clicked away. There will be duds, but your best chance of getting a great shot is to take lots and lots of pictures. Memory is cheap! I think I took 6 or 8 shots of the situation, most of which were nothing special. But, I got the cute jumping shot I wanted! 2. Experiment with pictures from the side and back. It’s not always necessary to see your child’s face. When I’m at the pool I tend to move around a lot, and utilize all of the space available to me. 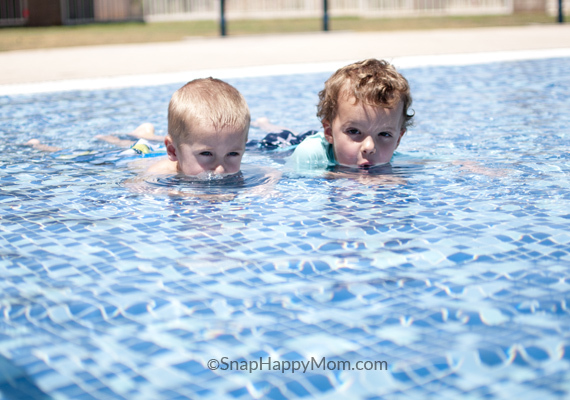 Swimming pictures already have so many elements in common that you need change up your position, else all your pictures will look the same! 3. Vary your shooting angle according to the situation. 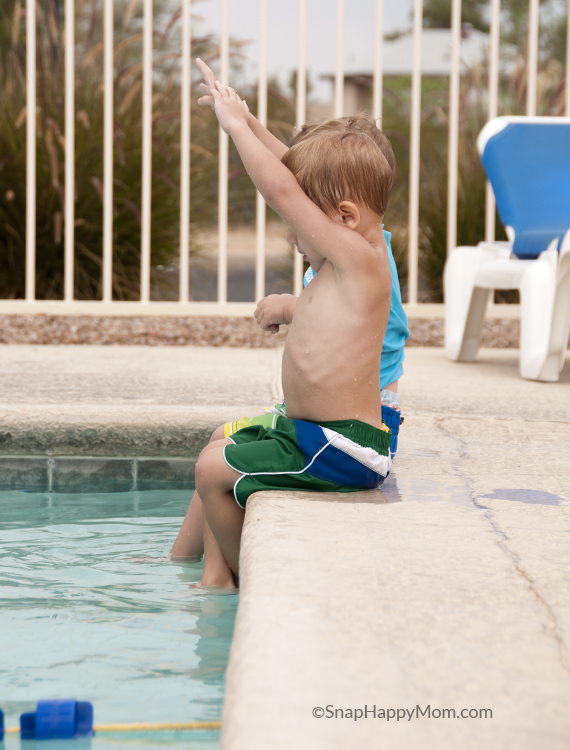 Angle is one of the few factors you can control when you’re taking pictures at the pool, so use it wisely. Be willing to experiment to see what is going to work best that day. Here’s a not-so-good example: I positioned myself up high and pointed the camera down so I could keep a very blue, watery background all around my child. It was a good idea in theory, but didn’t work out this time. My son couldn’t open his eyes because the sun was right behind my head. Oops! Plus, I got my own shadow lurking in the bottom of the frame, since the sun was a behind me: never a good idea. To fix it, I crouched down lower and took the second picture at his level, as seen below. Much better! 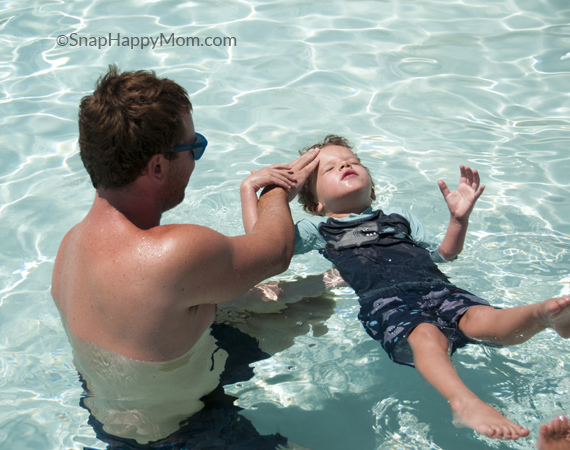 However, certain situations like back float and backstroke will be better if you take a higher angle, and then point down at your child. The farther away your child is from you, the higher you’ll likely need to be. This is definitely the time to use a zoom lens, since you won’t be in control of where the action is taking place. It’s one of the only times I recommend using a zoom instead of a prime lens! 4. Overcast days are perfect for swimming pictures. Is it gloomy outside? 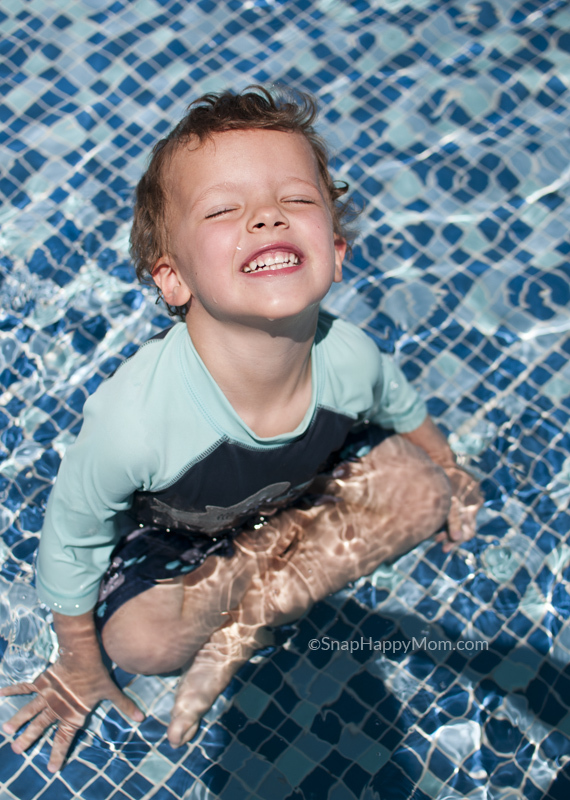 Those days are awesome for swimming pictures because there will be less glare on the water and softer shadows. 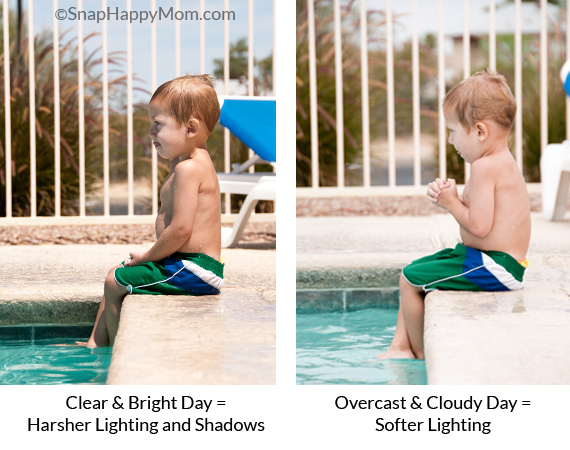 I happened to these near-identical shots on two different days of the swim lessons: the one on the left was a bright clear day, and the one of the right was cloudy and overcast. There is such a difference in the quality of light here! The overcast day didn’t seem perfect for swimming, but the diffused, soft lighting provided a much prettier situation for photos. 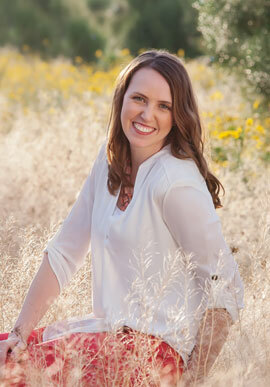 I know you don’t always have options, but if it’s gloomy out, grab your camera and shoot away! 5. Get the cute friends and family shots. 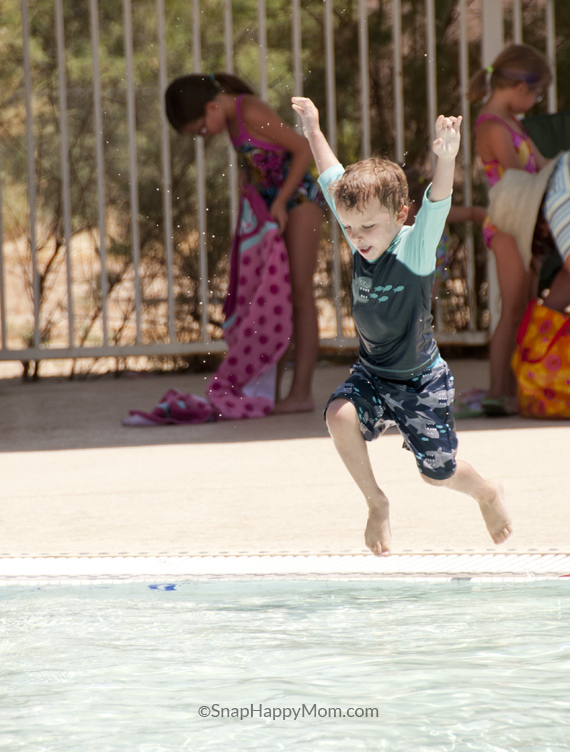 Standing in the shallow end is a great way to capture a full-body shot of those swimsuit-clad kids. …And by all means, if anyone has a matching suit, take the photo! 6. Don’t forget the towels! 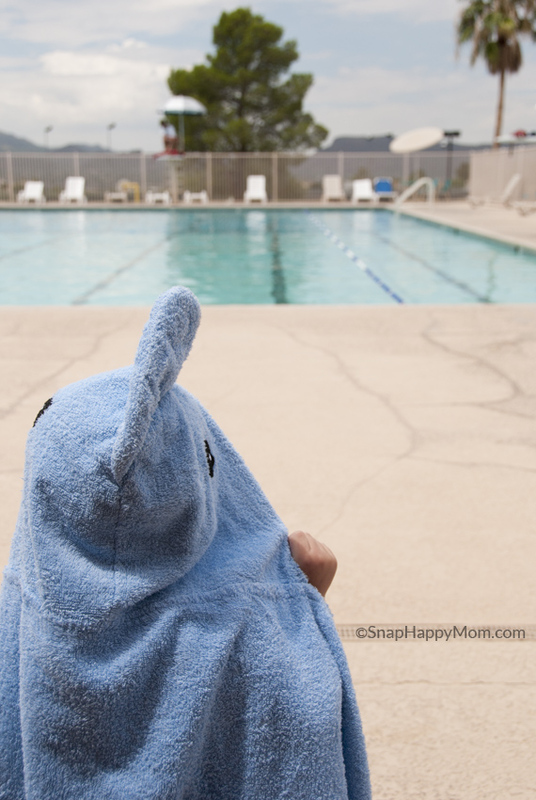 Of of my favorite summer poses is when kids are wrapped up in a towel after a swim. Make sure you get that photo! Please don’t play photographer when you are supposed to be taking care of your children. I took many of these pictures when my daughter was at home or with another mom to watch her. 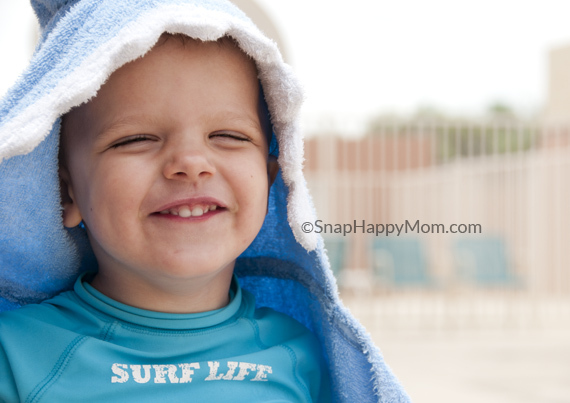 Yes, I know there are lifeguards, but it’s not worth ignoring a curious toddler to fiddle with your camera. 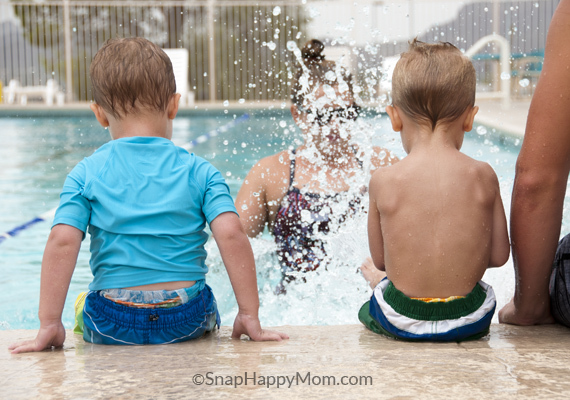 If you take swim lessons with a friend, switch off days for who plays photographer so that someone is always the dedicated parent. 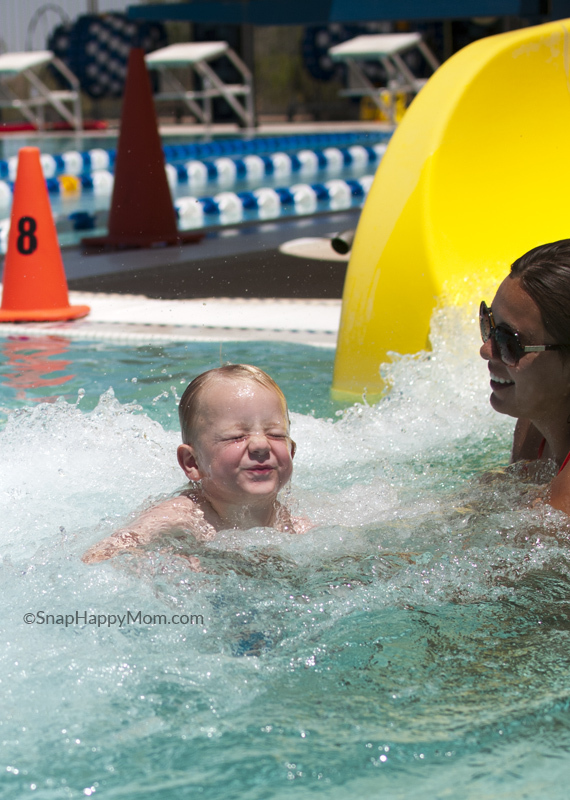 It’s been fun to compare pictures of swim lessons from year to year. Good luck capturing this summer tradition!